Residential Property Managers and Private Landlords. 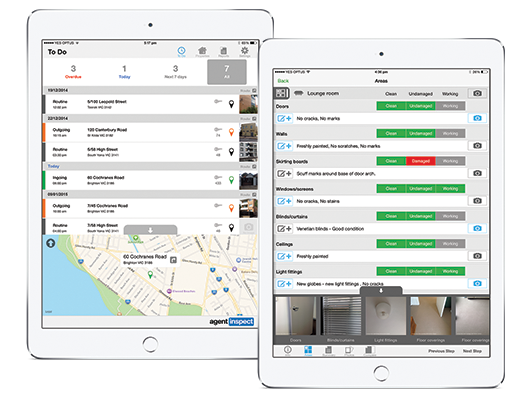 A mobile-friendly property inspection app for Property Managers to Schedule, Inspect & Report condition reports and periodic property inspections from your iPad. Whether you are managing a single dwelling or multi-tenancies, instantly increase your productivity conducting professional property inspections with AgentInspect. Save time and money producing professional property Condition Reports and Periodic/Routine inspection reports directly from your mobile device - save to Dropbox as well. Pros: Easy to use and very detail. A great record of all your properties. Move in and move out for security deposit is very helpful. Cons: NO customer support you are on your own if you use this app. Very hard to get it to email to owner set up is difficult.